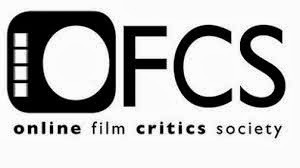 Following the 1939 original with Janet Gaynor and Fredric March, the 1954 remake with Judy Garland and James Mason, and the 1976 remake with Barbra Streisand and Kris Kristofferson, 2018’s “A Story Is Born” is the fourth (or fifth, if 1932’s “What Price Hollywood?” counts) incarnation of a well-worn standard as old as Hollywood, this time with Lady Gaga and Bradley Cooper. Rather than live in the shadows of its predecessors, this is an impassioned, intimate, and unusually fresh romantic drama made modern but remaining timeless about the cycle of show business and fame in which one-half of the couple’s rise is the other’s fall. 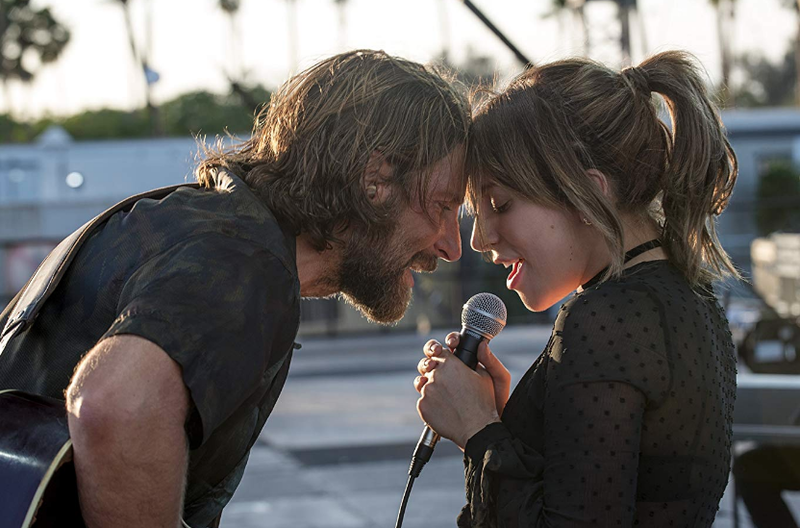 Two stars end up being born in “A Star Is Born”—Lady Gaga in her first starring role and Bradley Cooper as a first-time director—and they’re both dynamite. 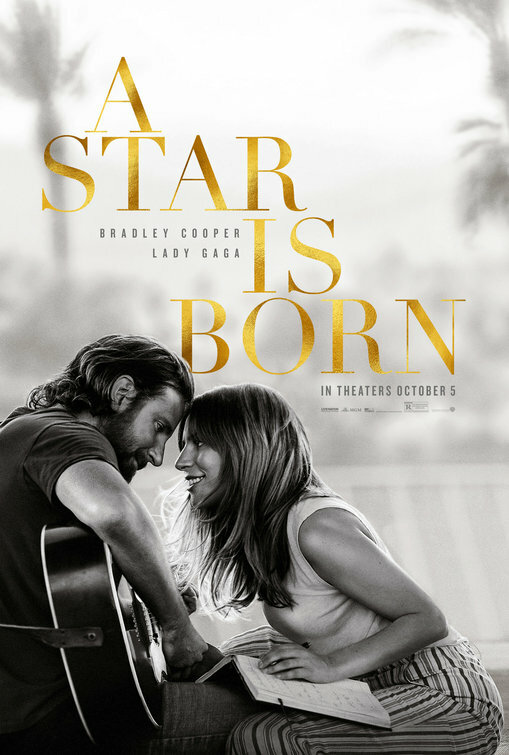 Jackson Maine (Bradley Cooper) is a country rock star on the edge of decline on account of his alcoholism, pill popping, and tinnitus in his ear. One night after a show, he needs another drink and staggers into a drag bar to hear a server perform Édith Piaf’s “La Vie en Rose” in French. Her name is Ally (Lady Gaga), and Jackson sees such untapped talent in Ally that he asks her out for a drink afterwards and they spend the rest of the night together just talking in a parking lot. Ally makes such an impression on Jackson as a performer, a songwriter, and a person that he invites her backstage on his next show, and once he calls her onstage to sing her song, “Shallow,” with him, Ally catches everyone’s attention. Even as the music industry attempts to change Ally’s image into a pop tart, she refuses to sell out her individuality, but as Jackson’s lifestyle spirals and hits rock-bottom, his career starts to flag. With his voice a few octaves lower, Bradley Cooper is still his charismatic self but completely transforms himself as Jackson Maine. Shaded and moving, this might be his career-best performance, diving into the rootsy musician struggling with a self-destructive disease and finding an aching gravitas. Along with his deep vocal inflection, Cooper more than holds his own as a singer. Already a star in the music industry, Lady Gaga (as she is credited) deserves to be a blazing star for her revelatory on-screen work here and to be credited as a preeminent talent who can decidedly do it all. After “American Horror Story” creator Ryan Murphy gave her a chance to vamp it up in that show’s fifth season “Hotel” and earn herself a Golden Globe, Gaga is a captivating presence and lives in the role of Ally with a raw, soul-baring authenticity and a natural intuitiveness. Neither codependent nor a meek ingenue—in fact, she punches a cop who stops Jackson for an inappropriate photo op—Ally is made dynamic and relatable by having personal insecurities based on her appearance, particularly her nose, and Gaga’s transformation of Ally takes no effort to buy into, considering the real-life performer’s natural stage abilities. 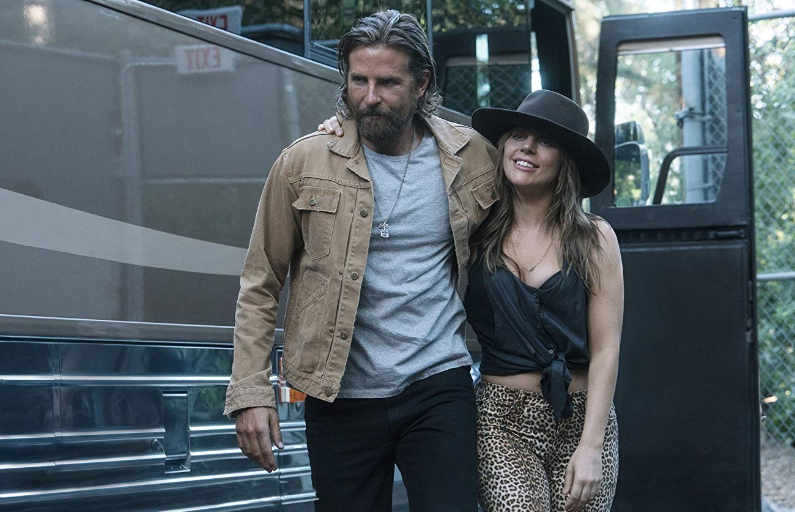 Together, Cooper and Gaga are such generous scene partners, giving as much as they take and creating an electric, unfakable chemistry as their relationship blossoms. The supporting parts are lovely and textured, including the likes of Sam Elliott, who’s excellent and heartbreaking as Jackson’s older half-brother and long-suffering tour manager Bobby; Andrew Dice Clay, as Ally’s doting limo-driver father; Anthony Ramos, as Ally’s close friend Ramon; and Dave Chappelle, in one scene, as Jackson’s supportive old friend. “It’s the same story, told over and over — forever,” says Bobby Maine in a late scene to Ally. He’s talking about his brother’s music, but Bobby might as well be speaking about “A Star Is Born” being another retelling. It works as a reminder that the success of any story, no matter how many times it has been told, is in how it is told, and perhaps the reason this story endures for so many generations is because it resonates. 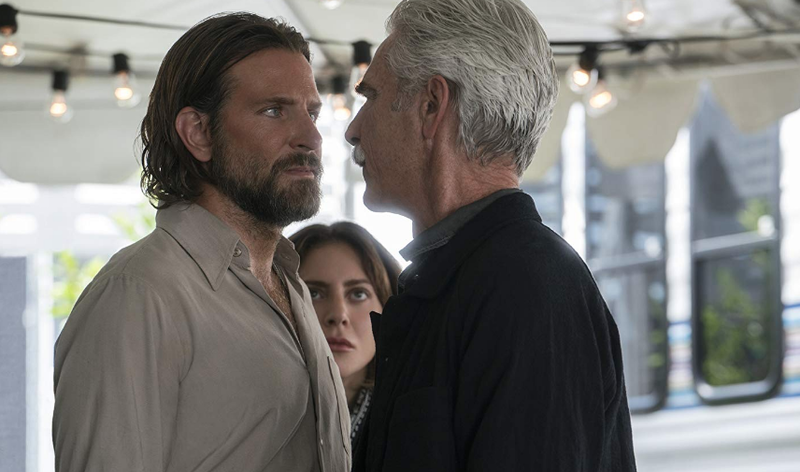 Making his mark as an assured debuting filmmaker, Bradley Cooper retells this story as a labor of love rather than a safe, beat-for-beat rehash. He finds a very delicate balance in tracking Jackson’s fall as Ally ascends to stardom in moments, including one at the Grammy Awards, that could play as melodramatic histrionics but otherwise ring true with a pathetic sadness. 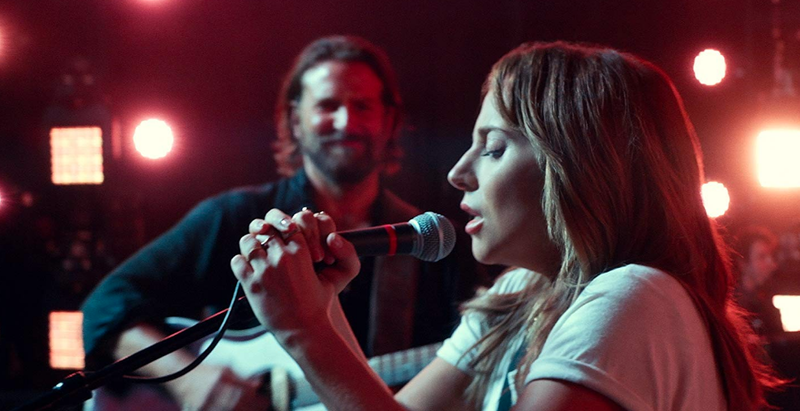 As the film is beholden to the other films’ inevitable path, how the story gets to that point feels devastatingly earned rather than stale or manipulative, ending on a lyrical note as Ally belts out “I’ll Never Love Again.” Destined to get audiences swooning and sobbing, a soulful iteration of an oft-told story has been born.